Makari de Suisse Review: Is Makari de Suisse A Scam Or Legit? 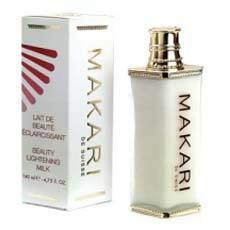 Makari de Suisse is a line of beauty products devoted to whitening and clarifying skintone and fighting signs of aging. The line offers skincare products for the face, body, and bath; haircare products; cosmetics for the face, lips, and eyes; fragrances; and accessories. Most products are marketed towards men and women of color. Product prices range from $20-100 and are generally slightly above the average cost of similar products. Returns are evaluated on a case-by-case basis. A fully, moneyback refund is available if a product is returned within 30 days, and the customer service representative deems that a full refund is in order. Makari de Suisse is a well-established member of the beauty industry, serving a niche market of men and women of color. Their products are designed to answer to the problems which their customers have experienced with traditional beauty products, which are often designed for Caucasian skin types. Makari de Suisse uses all natural ingredients in their products, which are manufactured in Switzerland. The products omit the use of several chemicals which have been shown to have detrimental effects on the health. In addition to the products they offer, Makari also has a robust media presence, shedding light on the difficulties which face men and women of color in a predominantly “white” culture of beauty. How Makari de Suisse Works? Makari de Suisse offers over 60 unique products, and each of them have a working process designed to target specific beauty challenges. Face whitening products, generally, moisturize and nourish skin cells, so that cellular metabolism is increased. An increase in cellular metabolism leaders to a faster turnover rate of dead or discolored cells, so that vibrant new cells are always at the surface of the skin. Toning gels contain active whitening agents, which go one step further in bleaching away blemishes and discolorations. Body creams and bath products moisturize and exfoliate the skin, so that rough dead cells are rubbed away and cells at the skin’s surface are kept healthy and plump. This creates an overall softness in the skin. Body creams also have light fragrances that make the skin more pleasant to touch. Hair products provide the proper minerals and nutrients to boost the health of skin cells that produce hair. In turn, the hair that these cells produce is stronger, shinier, and faster-growing. For an in-depth explanation of the working process behind individual products, visit Makari’s website! A full list of ingredients is available for all of Makari’s products on their website. The company is committed to using natural ingredients and avoiding potentially harmful chemicals. Most ingredients are plant extracts or naturally occurring vitamins. Reviews for Makari products usually range between 3.0 and 3.5 stars. While many customers report that the products had a visible effect and they would buy them again, an equal number of customers report having breakouts after using Makari products. Makari de Suisse has a great selection of products for people of color and plays an important role in filling the ethnic gap in the beauty industry. In marketing content, the manufacturer states the ingredients are all natural, which is a bonus. If you have sensitive skin, you might want to read the full ingredients list of Makari products before ordering. Many customers have reported having breakouts, so if you see any ingredients that you know irritate your skin, avoid buying the product.